Note from shop owner Hello! We will open the shop up as soon as we are back! Given as a gift. HUGE hit ! New Alzheimer’s awareness leather bracelet. A donation will be made to the Alzheimer’s Association for every bracelet sold. 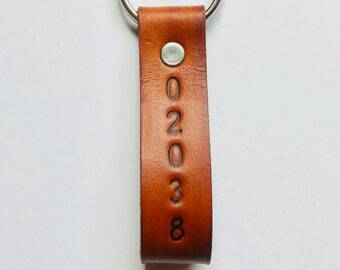 Custom zip code key chains available now! These would make a great house warming gift or a treat for yourself! 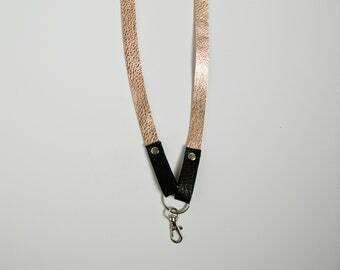 New rose gold lanyard in the shop! Many accent colors to choose from! Since I was little, I have always enjoyed making things for myself and others. I love using my hands to create something out of nothing. I have always loved picking and choosing different colored materials for someone that I think they will enjoy. My earliest memories of crafting was with my mom. I remember heading to the fabric store and choosing fabrics with her to make clothing for me, my sister and other relatives. I remember feeling so excited to see what the fabric would turn into, dreaming of the fabrics potential and possibilities. I will always treasure our special time together at the fabric store where I first learned to dream about handmade creations. I have always wanted to create my own line of items that I can share. I love looking at colors that inspire me to create and bring joy and happiness to people’s lives. It is also a dream come true to be doing this with my husband, Sean. We love working together and enjoy creating new products. He is my best friend and I am so happy to working with him by my side. We both enjoy collaborating with customers to discuss their jewelry ideas and other creations. It is exciting to use that information and create new custom pieces. We are genuinely so excited to see customers enjoy our hand crafted products and can't wait for what the future might bring. Jewelry Designer, Crafter, Teacher, Mom, Wife, Lover of thrift stores, Avon bottles, daisies, audio books and all things orange.